"There was no decision to make Twitter the focus of my career," Fitton says. "Twitter decided for me. Somehow I became a Twitter-for-business consultant without ever calling myself that." Fitton's enthusiasm for the possibilities of what she calls "enterprise microsharing" motivated her to revive her Pistachio Consulting business in September 2008 to connect clients to new ideas and innovation in social media. Since then, she has co-authored the book Twitter for Dummies and launched oneforty.com , an online storefront that aggregates the sprawling Twitter application ecosystem in a central, user-friendly repository. Her Twitter feed, which combines personal musings with insight on Twitter's role in business collaboration, attracts about 40,000 followers. "When people started calling me and hiring me, there were almost no questions asked--they had already decided they wanted to hire me. They felt like they already knew me from Twitter." Stories like Fitton's are becoming as commonplace in the small-business realm as Twitter itself. Companies of all shapes and sizes are seizing the possibilities of digital word-of-mouth marketing. Dell recently credited its Twitter feed, which the computer giant uses to offer deals and discounts, for driving more than $3 million in sales in a two-year period. At the opposite end of the business spectrum, New Orleans-based startup Naked Pizza turned to Twitter to trumpet its "Eat Like an Ancestor" promotion--boosting the company's revenue by 68 percent in a single day. "Local boutiques, Realtors and restaurateurs are all waking up to the possibilities of Twitter," says Fitton, of Boston. "It feels like it's a gimmick, but it's really a vector for small-business practices. It's very powerful and viral." For small businesses without the resources to explore conventional advertising options, Twitter presents a free and efficient alternative to promote goods and services directly to customers, exploiting the immediacy and intimacy that other channels simply can't match. Recent data issued by market researcher Kelsey Group indicates that 9 percent of small businesses now wield Twitter accounts as public relations tools. "Twitter is a new way to do customer relationship management," says media veteran John Battelle, founder of The Industry Standard and more recently founder and CEO of Federated Media Publishing. Battelle's new venture is a digital media and marketing company that uses Twitter as fuel for targeted services such as ExecTweets and BingTweets. "People use Twitter to promote just about everything. Its speed and openness has allowed for a lot of innovation." Twitter as a business entity is also the subject of much scrutiny. Last September, the San Francisco startup was valued at $1 billion despite the absence of a clear-cut revenue model or even any profits. Creative director Biz Stone has said that Twitter won't launch a dedicated advertising effort until 2010. But if it seems like he's not in a rush, maybe it's because of all the profitable businesses that offer services and applications using Twitter. They prove that Twitter can be used to make money. Created in 2006 by software architect Jack Dorsey, Twitter transformed from cult phenomenon to mainstream juggernaut in 2009, revolutionizing how individuals and business entities alike interface with the world around them. Tweets--the 140-character messages that make up the global Twitter dialogue--have become the preferred medium of communication for more than 50 million executives, celebrities, athletes and everyday people. Whether it's President Barack Obama touting healthcare reform or Paula Abdul confirming her departure from American Idol, Twitter consistently trumps rival media platforms by breaking news, generating controversy and provoking debate in real time. If it doesn't matter on Twitter, it simply doesn't matter. 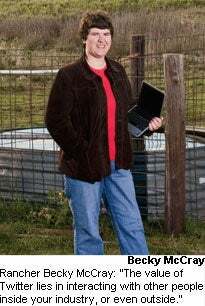 "Twitter is about reaching the right people at the right time," says Becky McCray, a longtime Twitter user and advocate who operates her own cattle ranch and liquor store as well as a website, SmallBizSurvival.com., in Oklahoma's Woods County. "But you have to think carefully about what messages you want to communicate." Here are some recommendations for what to do--and what not to do--on Twitter.
. Listen before speaking. "When you sign up and start reaching out to folks, listen to them before joining the conversation," McCray says. "What are their customers talking about? Who are they listening to, and what can I learn from them? When you feel it's time to tweet some messages, share things you find interesting--share things you wish other people would share."
. Don't be boring. "Make sure your tweet is interesting to the reader--be unselfish, and be useful," says Laura Fitton, co-author of the book Twitter for Dummies and founder of the Twitter application storefront oneforty.com. Short, direct messages work best, especially given Twitter's 140-character limit. Talk about what your business is doing--e.g., new products, services or promotions, or anything else likely to pique the curiosity of your clientele.
. Consider the source. "The beauty of Twitter is that tweets with value are almost instantly recognized," says John Battelle, founder, chairman and CEO of Federated Media Publishing. "Does it come from somebody who's been on Twitter for a month, or for a year? Someone with 10 followers, or 10,000 followers? Did that tweet get picked up and re-tweeted? You can tell a lot about the value of a tweet by those metrics."
. Update daily. Give your customers a reason to follow and return to your Twitter feed. Download a mobile client to your smartphone to facilitate regular updates while on the go--some of the most popular include Twitterific, TwitterBerry, PocketTweets and Twidroid.
. Embrace Twitter applications. Don't wait for followers to find you--identify and connect with local Twitter users via services such as Twitter Advanced Search, ChirpCity, Nearby Tweets and Tweepz. Other Twitter apps of value: SocialOomph (for scheduling tweets, tracking keywords and sending direct messages), CalTweet (for tagging, promoting and sharing upcoming business events) and Twitalyzer (for measuring the impact and influence of your tweets). "Twitter is a tool that's incredibly powerful," McCray says. "What makes it powerful is the fact that it can be used in so many different ways." Twitter is predicated on the concept of followers. When users choose to follow another Twitter user's message feed, their tweets appear in reverse chronological order on the subscriber's main Twitter page. Users can send and receive tweets via the Twitter website, text message or any number of external clients, including TweetDeck, Tweetie or Seesmic. Dorsey published the first Twitter message on March 21, 2006, and a full-scale version of the service launched three months later. Twitter was spun off from parent firm Obvious Corp. in April 2007, just weeks after the annual South by Southwest festival in Austin, Texas. That event is widely cited as the tipping point in Twitter's evolution: During the four-day festival, usage leaped from 20,000 tweets per day to 60,000, an increase credited to a pair of 60-inch plasma screens in the conference hallways exclusively streaming Twitter messages. Buoyed by media attention on celebrity users such as actor Ashton Kutcher (more than 3.75 million followers as of October 2009) and NBA superstar Shaquille O'Neal (almost 2.5 million), Twitter emerged as a mainstream force in the spring of 2009. According to research firm comScore, the service attracted 54.7 million unique visitors worldwide this past August, up from 4.3 million in August 2008. Federated Media's Battelle was quick to identify Twitter's value as a tool for businesses to interact more directly with customers. "When Twitter erupted onto the scene, it became clear to me that by listening and responding to your followers, you can create value," Battelle says. "The question facing brands is how to join the conversation in a way that isn't boorish or stupid. The question facing us is how to take this fire hose of information and curate it in a way that creates value for the brand and also creates value for the brand's audience." Federated Media's first response was ExecTweets, a real-time tool that helps users find, follow and engage with business executives on Twitter. Introduced in March 2009 in conjunction with sponsor Microsoft, ExecTweets curates and aggregates Twitter posts by verticals, promising users a direct portal into the minds of the thought leaders influencing their industry. According to Battelle, the service now boasts close to 1 million users. It also paved the way for related efforts, including BingTweets (another Microsoft-backed project, this one fusing Bing search engine results with up-to-the-minute tweets on the same subject) and the Palm Trend Tracker, which spotlights current and emerging Twitter topic trends. 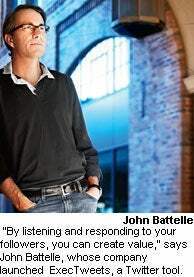 Twitter is a resource businesses are only just beginning to tap, Battelle maintains. "Twitter is a way of seeing stories through the lens of a community," he says. "A tweet is in fact the equivalent of a search query--it reflects the user's interests. Imagine an entire search system built around Twitter that sees each tweet as a query and puts up automated text-based ads. It's a model that has yet to be fully leveraged." While companies like Federated Media are looking to Twitter to enhance their existing business, others are using the service as a launching pad for new entrepreneurial pursuits. The majority of startups piggybacking on Twitter's success are third-party software developers. Twitter's open programming environment has given birth to a sprawling developer ecosystem creating premium and free applications for both the web and mobile devices. Many Twitter apps target small businesses, enabling them to more efficiently access, update and manage their feeds. One app, twtQpon, offers tools to create exclusive coupons for followers, while another, Monitter, offers a live streaming view of what Twitter users are saying about your company. Laura Fitton's oneforty.com collects these scattered Twitter applications in one place--users can search for specific apps, browse by platform or sort by popularity or rating. "The application ecosystem flourished so fast," she says. "We have about 1,600 apps in the store, and there are as many as 20,000 more on the way." For businesses that have yet to embrace Twitter, the microsharing concept and its attendant pool of applications may seem incredibly complex--even daunting. Fitton insists it's anything but. She says all companies with an event-driven or locally focused business model are poised to benefit from a Twitter account. Businesses that rely on contact lists--consultants and real estate agents, for example--are also positioned to maximize the social media opportunity. "Any company that would benefit from a monthly e-mail newsletter would benefit from a Twitter feed," Fitton argues. "Because it's all voluntary, you never feel like you're spamming your customers." The key to successful tweeting, she says, is offering useful content and making sure the tweet is interesting to the reader. "Twitter feels like a brave new world, but it's basic behaviors we all know," she says. "Think abut how you approach a cocktail party--you don't walk up to a cluster of people and start talking. You slowly merge yourself into a conversation. You listen and see what other people do, and wait to speak until you can offer something useful. Etiquette on Twitter equals effectiveness." Even companies without customers on Twitter stand to benefit from the service's reach and scope. Becky McCray is a three-year Twitter veteran who operates her own cattle ranch and liquor store, as well as a website, SmallBizSurvival.com ., in Oklahoma's Woods County. She credits Twitter as the source of business tax recommendations from an accountant, promotional advice from a marketing consultant and startup tips from the founder of multiple tech firms. "The value of Twitter lies in interacting with other people inside your industry, or even outside," McCray says. "It's ultimately about improving your business, whether you're connecting with new people, forming a new project with them or just learning from them." If it seems Twitter's beauty rests in the eye of the beholder, that's the point. The service continues to evolve, adapting to the respective needs and demands of each individual user. Meanwhile, all eyes are on the company as it continues to evolve and faces the seemingly inevitable backlash that comes with becoming so big, so fast. "[Twitter has] to focus on making its product better and more valuable, as well as drive towards a viable, scalable, long-term revenue model," Battelle says. "One thing that made Google so powerful is not only that it allowed for searches to be so good, but also because it came up with a revenue model that made their business better. By tying commercial information to your query, Google delivered value to the user, to the advertiser and to Google. Twitter could put up display ads right now, and a lot of people would want to buy them, but it's not a long-term solution--they need to add value for all parties." While some critics question Twitter's long-term viability--pointing to the declining fortunes of once-hot social networking platforms like Friendster and MySpace--proponents argue the core concept is here to stay. "At last count, as many as 500 rival services have come along and tried to usurp Twitter," Fitton says. "All of them offered essentially the same form factor, and none of them managed to secure the same audience. Compare it to going to professional networking events--you meet a lot of strangers, but what are your best mathematical options for making a good connection? Twitter is also random, but you can meet many more people in much less time. And best of all, you can do it in your pajamas."